Xiaomi Mi 5s, successor to the Xiaomi Mi 5, has been doing rounds on the Internet lately. 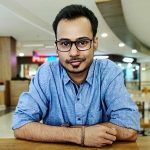 Thanks to its appearance on AnTuTu, we know what kind of specs to expect. However, we now also know how it will look, thanks to a live image that leaked online. Going by the image, we can say that the Mi 5s looks similar to the Mi 5 (well of course). However, the bezels seem to be thick as compared to the Mi 5. Also, something you will notice first is that the home button is no longer oblongated and is now circular in shape. The home button should be flanked by capactive touch keys like the ones we saw on Mi 5. According to the AnTuTu listing, the Mi 5s would come with Snapdragon 821 SoC, Android 6.0.1 Marshmallow and Full-HD display. It’s very likely that Xiaomi will stick to the 5.15-inch screen size. However, there might be multiple variants available which would differ in RAM and internal storage. 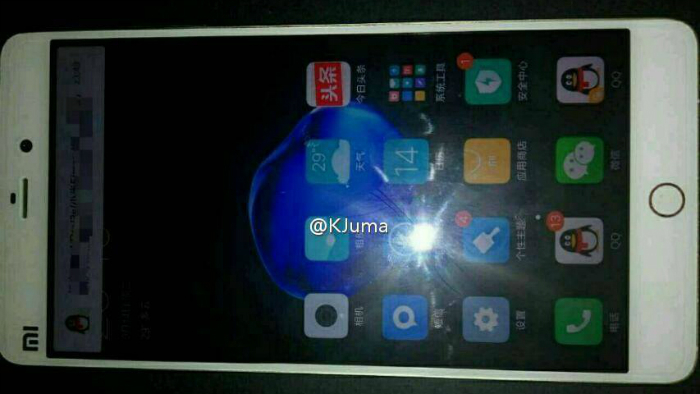 The higher model of Mi 5s is rumored to sport 6 GB RAM along with an internal storage of 256 GB. Besides this, the Mi 5s is also rumored to feature ultrasonic fingerprint scanner based on Qualcomm’s Sense ID technology which would make it easy to unlock the phone with wet fingers as well. A render leaked in July also suggested dual rear camera setup on the Mi 5s, however, we didn’t hear much about it later. We expect more information to be shared through leaks in the coming days.